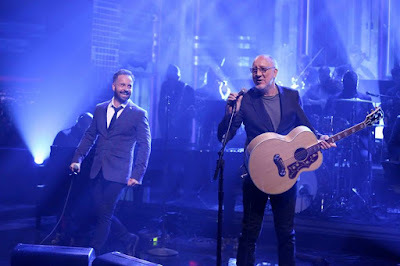 Pete Townshend performed The Who classic, “Love Reign O’er Me”, on NBC-TV’s The Tonight Show starring Jimmy Fallon on September 8, and video from the program is streaming online. The rocker was joined by singer Alfie Boe, house band The Roots and a small orchestra for the track from his 2015 CD, “Classic Quadrophenia”, which delivered a new orchestral version of The Who’s 1973 concept album based around lead character Jimmy’s search for an identity amongst the mods and rockers in mid-60s Brighton. Townshend, Boe and Billy Idol are currently bringing the project to fans on a five-show mini-tour of the US, with Pearl Jam’s Eddie Vedder set to make a guest appearance during the Chicago, IL stop on September 13. Townshend will regroup with Roger Daltrey as The Who to launch a series of South American dates later this month; the run includes an October 1 stop in Buenos Aries, Argentina opening for Guns N’ Roses.